bootloader – is a system configuration software that has knowledge about the low-level details of the hardware system and runs once power is applied to board. Primary responsibility is to initialize the hardware, especially the memory subsystem, and load the OS image. Most embedded systems are architected in such a way that when the Linux OS takes control, the bootloader ceases to exist. kernel – the Linux OS image. root file system – contains the application programs, system libraries, and utilities that make up a linux system. What is a file system? 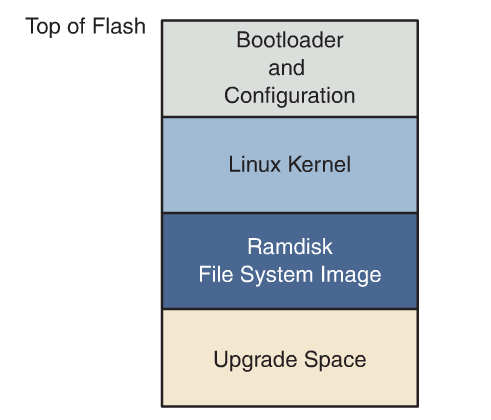 a file system consists of a predefined set of system directoeries and files in a specific layout on a hard drive or other medium that the Linux kernel mounts as its root file system. Initializes critical hardware components, such as the SDRAM controller, I/O controllers, and graphics controllers. Initializes system memory in preparation for passing control to the operating system. Allocates system resources such as memory and interrupt circuits to peripheral controllers, as necessary. Provides a mechanism for locating and loading your operating system image. Loads and passes control to the operating system, passing any required startup information. This can include total memory size, clock rates, serial port speeds, and other low-level hardware-specific configuration data. Kernel context – kernel owns all system memory and operates with full authority over all system resources. kernel has access to all physical memory and to all I/O subsystems. It executes code in kernel virtual address space using a stack created and owned by the kernel itself. User space – user space process has restriced access to the system and must use the kernel system calls to request kenel services such as device and file I/O. User space processes or programs operate in a virtual memory space picked and managed by the kernel. The kernel is cooperation with specialized memory management hardware in the processor, performs virtual to physical address translation for the user space process. What is the purpose? Single biggest benefit of this architecture is that an error in one process can’t trash the memory space of another. The following is the sequence of events on an IA-32 embedded boot flow. 1. The processor comes out of reset, and the reset code within the firmware executes. This firmware initializes the memory and boot devices. The boot device loads the starting code for the second stage boot loader (for example, elilo/grub2), copies it into memory, and jumps to it. 2. The second stage boot loader finds the compressed kernel image file (bzImage) from mass storage, copies that into memory, and jumps to it. 3. The start of the kernel image contains uncompressed code. This code decompresses the compressed kernel image within the bzImage file into the system RAM. It then transfers control to the uncompressed kernel in memory. The kernel’s main starting point is start_kernel() in kernel/init/main.c. 4. The kernel then performs all internal initialization, along with device initialization for drivers that are integrated into the kernel. The kernel then schedules the kernel_init() as the first thread (PID 0).